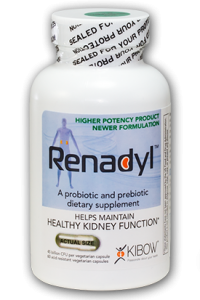 Renadyl™ is supporting the kidneys by helping Colon. When the body digests food, waste products are left behind in the bloodstream. Since the waste can be harmful to the body, it is usually filtered out of the blood by the kidneys and passed as urine. However, when kidneys are damaged, the toxic waste (or toxins) builds up in the blood. Eventually, these toxins wind up in the colon. When toxin levels increase above the normal range, they can cause a host of serious health problems. To see a full animation that shows how Renadyl™ works, watch the video below. 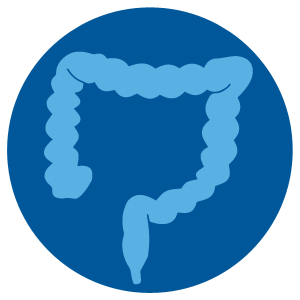 In ideal health, the body will evenly divide any uremic toxins in the system between the blood and colon’s lumen (gastrointestinal [GI] tract). If the kidneys are diseased, however, there may be high levels of these toxins in the blood. Because there are more toxins in the blood, more toxins eventually make it into the colon. 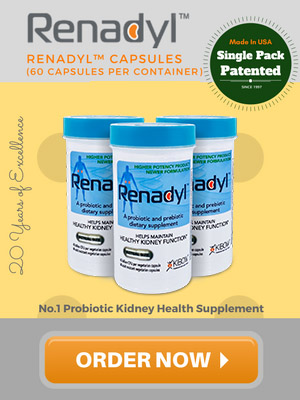 The patented enteric toxin reduction technology found in Renadyl™ uses these toxins to feed the probiotics and helps them grow in size and number. This “army of probiotics” helps transport more toxins through the colon’s lumen and out of the body with feces. When the kidney becomes impaired or damaged from disease, uremic toxins build up in the blood. Large numbers of these toxins make it into the colon because of the extensive network of blood vessels that surround it. 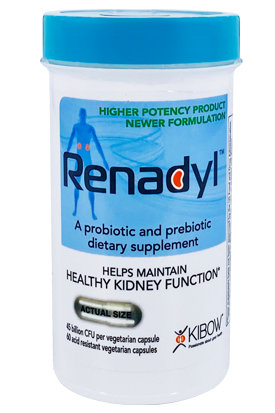 Once Renadyl™ enters the GI tract, probiotic microbes are released from its gastric acid resistant capsule and enter the large intestine. Once in the colon, the microbes target and metabolize the uremic nitrogenous wastes as nutrients for probiotic growth. As they metabolize the uremic toxins, the microbes begin to multiply and this in turn allows for even a greater diffusion of toxins into the bowel. 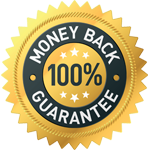 Eventually, the metabolized toxins are carried down through the bowel and out of the body as solid waste, sparing the compromised kidneys of the burden. Click here to download a Renadyl™ product information sheet (PDF).